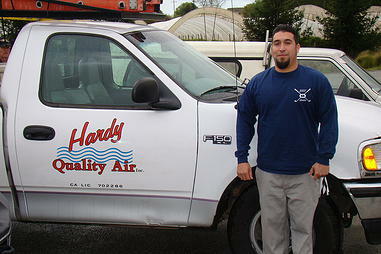 It is with the greatest of pleasure that I recommend Hardy Quality Air for heating and air conditioning service. Being new to the Aptos area, we were at the mercy of those service providers recommended by our real estate agent when we bought our home. Often, real estate agents will recommend services that are good. But in my experiences in purchasing homes ( this was my 8th), I’ve never had anyone recommended that was as great as Hardy Quality Air. Hardy Quality Air not only met these attributes, they were able to make recommendations that made sense. They understood and supported the options we chose. Their coordination with our schedule so the impact of the repairs they were asked to make would be minimal was very much appreciated. It really seemed that Darrell Hardy treated us like he would want to be treated were he to receiving similar services. Incredibly, the quality of service was not just in the interactions we had with Darrell Hardy, instead it extended to every worker in that company with which we interacted. Each and everyone was courteous, had great communication skills, and was an incredibly hard worker. Finally, we were so impressed with Darrell that we asked if he knew of others companies in the area that were of comparable quality. He went out of is way to provide us with several suggestions. Talk about service above and beyond the call of duty! There are few people I would bet on like I would bet on Darrell Hardy. If you ever have any needs associated with heating and air conditioning I hope you will consider Hardy Quality Air.